Now and again my Dad would take me and my brother to the pictures, probably the Gaumont (now Regent) or the ABC (long gone). Sometime in the '70s we saw a couple of Doug McClure features that have stayed with me: The Land That Time Forgot and At The Earth's Core. The former, I recorded off the tellybox at the weekend. The latter has Peter Cushing at the controls of a huge drilling machine named the Iron Mole (note). Rather than going through the mountain, they end up in a weird subterranean land controlled by flying reptiles. Who are also telepathic. And make a noise which I found disturbing as a youngster. With me as dashing Doug and Andy as eccentric Peter, we've been at the controls of our respective velocipedic machines en route to the Grumpy Mole. Odd name, ay what, though shares its nomenclature with a chain in Cheam. What are the chances? We've been to these Queen St premises before when it was Bernie Lees: that wasn't great and didn't last long. 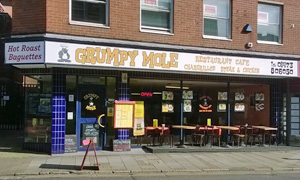 Come on Mole, do your worst. They've redecorated. Orange walls, random pics of flowers, the London skyline, beach huts, cartoons and menus from Singapore adorn the walls incoherently. Plenty of tabloids to titillate. Over there is a kids' playroom. We're over here by the window in the sun. Lots of tables (though sparsely populated) and far too much choice on the menu a la Travelodge. Waitress service involves much shouting back to the lady behind the bar to confirm what's available and what isn't. All very Ipswich. Still, here's my Dr Pepper and his Bounty shake. Takes time for our food to be prep-ed, hopefully a good omen. Andy's gone posh with his breakfast muffin topped with salmon and hollandaise. Good, says the man. I've got a huge plate with a huge amount of chips and a huge lamb burger with onions, etc. Size-wise, it wins. Quality-wise, I've had worse, though lose a mark for the non-Heinz ketchup. What with our chop-chop-busy-busy lives, there's no time for sweets. They're open well into the evening, too: maybe there's more custom then? Honestly, it all seems a tad odd and unfriendly. If I wanted some reasonably priced grub in this part of town, I'd head a few doors up to the always welcoming Central Canteen. Check back in a year to see if the GM is still here. If it was a car -- Zastava 101. If they were passing by -- Gian Sammarco.